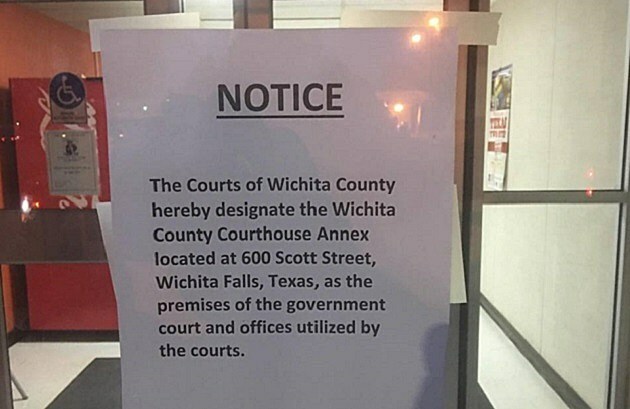 A Wichita Falls businessman says the county is wrong in its decision to ban guns from all areas of the Wichita County Courthouse and courthouse annex. Chris Reitsma, owner of Point Blank CHL, says the county’s decision is not in line with the decision of Texas Attorney General Ken Paxton. In Abbott’s six-page legal opinion, the governor asserts that guns may be banned from buildings that are solely used for courts, but the ban does not cover non-court-related offices in multiuse buildings. He asserts that handguns cannot be carried inside a courtroom or an office that is continually used for court purpose, such as offices or judge’s chambers. Under his legal opinion, guns could be carried through the courthouse halls, but not inside the courtrooms or judge’s chambers. It also specifically states that holders can carry inside the offices of the District Attorney, elections, County Treasurer, human resources, auditor, IT and Tax Collector-Assessor. Courthouse News Service reports that in December, AG Paxton, in a response to Hays County District Attorney Wesley Mau, stated that "…it is only the courtrooms, and those offices determined to be essential to their operations, from which Hays County may prohibit concealed handguns without risk of incurring the civil penalty’. You can read the complete memo from Paxton to Mau here. The Texas Tribune reports that on December 21st, Texas Attorney General Ken Paxton ruled that school districts could prohibit weapons on all district property, including sidewalks and driveways, but that local officials could only ban guns from courtrooms, not entire courthouse facilities. A memo from Governor and former Texas Attorney General Gregg Abbot to Ken Paxton’s office states that, as of September 1, 2015, it is unlawful for state agency or governmental subdivision to prohibit concealed carry holders from entering or remaining on government property. But Wichita County Commissioners gave notice on January 6 that guns would not be allowed anywhere on courthouse or annex property. We spoke with Precinct 2 commissioner Lee Harvey by phone who stated that Wichita County District Attorney Maureen Shelton had been consulting with the AG’s office on the matter. “I have to take her leadership on this”, Harvey stated. On Friday morning, Wichita County Judge Woody Gossom and Wichita County Sheriff David Duke joined ‘The Rise & Shine Show’ to discuss the decision. Listen to what they had to say in the player at the top of this page.